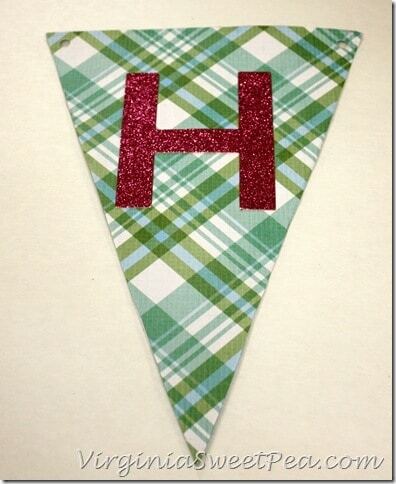 Pennants have been the rage on blogs and on the Internet for several years. 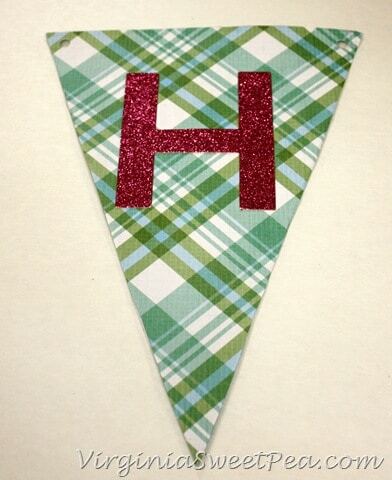 I’ve even made pennants for bulletin boards at school. 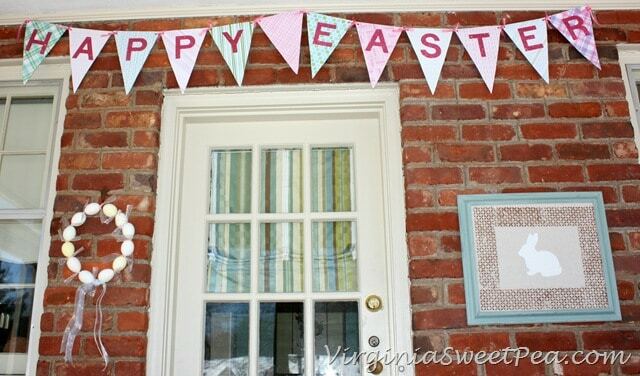 Crafting a pennant from cereal boxes is a great way to upcycle something that nearly every household has on-hand. Making a cereal box pennant produces a pennant that’s strong and that will last from year to year. 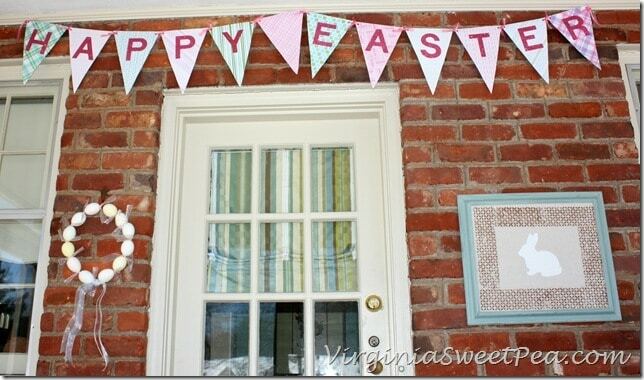 Easter is one of my favorite holidays for decorating and I thought it would be fun to craft a pennant to greet guests who enter our home via our screened porch. This pennant is so large that it’s also easily seen from the street. Each cereal box will yield two pennant pieces. 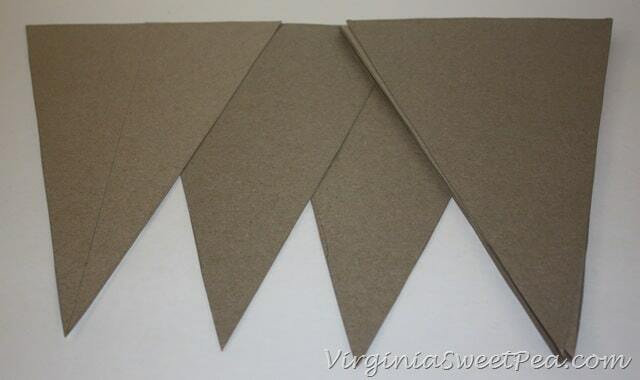 Decide on what you want your pennant to say, count how many pieces you’ll need, then save cereal boxes until you have enough to craft your pennant. Cut the sides, bottom, and top off of each cereal box. 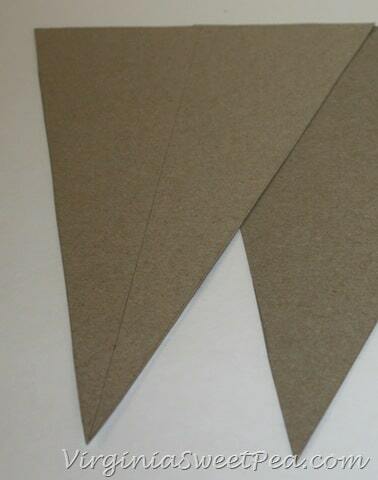 Measure the top edge, determine the midpoint, and draw a line down the middle of the cardboard piece. Draw a line from the each top corner to where you want the bottom of the pennant to be. Cut along the side lines to form the pennant. Continue making pennant shapes with cereal box pieces until you have enough pieces to make your desired word. Trace the front and the back of each pennant piece onto scrapbook paper. 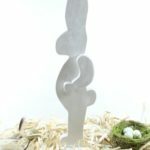 Cut out and glue. 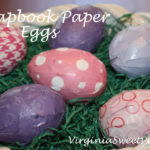 I’ve found Mod Podge to be a great glue for this project. After the Mod Podge dries, glue on letters cut out from matching scrapbook paper. Punch a hole in each corner of each pennant. Connect pennant pieces with ribbon. I found a length of ribbon the width of the top of the pennant piece to be the perfect size. Tie a loose knot to connect the pieces. 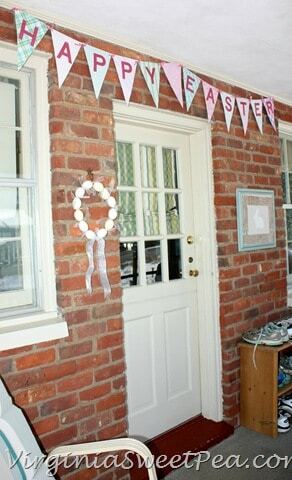 The egg wreath to the left of the door is nearly 20 years old and I’ve enjoyed using it ever since I made it. 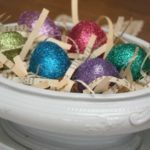 The eggs are blown out and strung through wire. 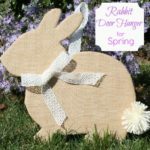 I first shared my DIY felt board for St. Patrick’s Day and you can see that I easily updated it for Easter by changing the felt shamrock to a felt bunny. A cereal box pennant can be customized for any holiday by using different patterns of scrapbook paper and adding different holiday sayings. 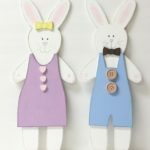 I think it also would be a fun project for teens to make with their name to hang in their room as a decoration. 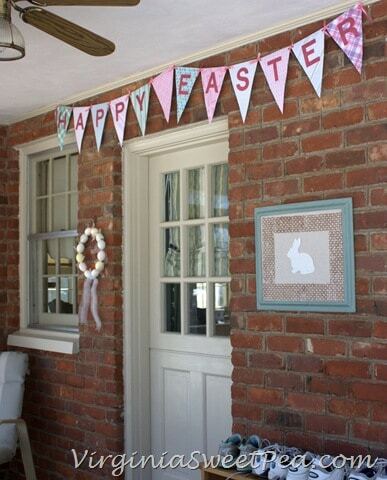 I’m so glad that Easter is late this year so that I’ll have plenty of time to enjoy my decorations. 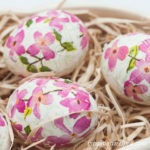 Check out my living room decorations and my project gallery for other Easter ideas. Great idea to recycle the cereal boxes. I like your banner. 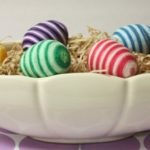 I love the colors of Easter. Paula, I am loving all your Easter projects! I especially love this upcycle – what a great way to reuse old boxes! 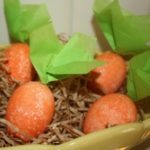 You should also do a tutorial on your egg wreath (even if it is 20 years old). That sounds so neat! What a pretty use of cereal boxes! And it will be easy to store for next year!